Advanced photo search program and Image Grabber or Pic Grabber instantly search and download thousands of images, Pictures or videos from the Internet. Imagine if your computer could instantly search and download thousands of pictures or videos from the Internet, based on one or two search words. Then imagine effortlessly scanning the pictures or watching slide shows of the results with a click of the mouse. Image Grabber, Pic Grabber - Free Pic Grabber 3.2 utilizes proprietary technology to search the Web, intelligently looking for pictures and videos that best match your search words. Results are organized by Stock Photos, Clip Art, Global Search Results and other specific categories. Initially, the program only downloads small (thumbnail) images representing each picture or video. You scan through and decide what you want, then FreePicGrabber downloads the full-sized media to your hard drive. After that, simply move your mouse over the thumbnails to see their full-sized versions on the left, or double-click to watch full-screen slide shows. Image Grabber, Pic Grabber - FreePicGrabber is available directly through the Internet Explorer, so you can type your queries while browsing. Or if you prefer, it can run as a separate application. The software lets you manage many simultaneous searches and downloads. An optional Parental Control filter is available for blocking content from adult Web sites. Spyware Killer - A powerful removing spyware progarm, protects your privacy, detects and kill spyware, stops hackers etc. Site Sounds - A fun and useful program used to audibly and visually monitor the traffic on your website. 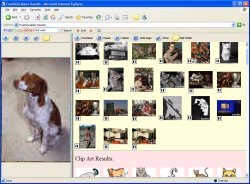 Web Photo Gallery - Online web based photo gallery applications.